Rust is always an issue this time of year, with summer heat and humidity. 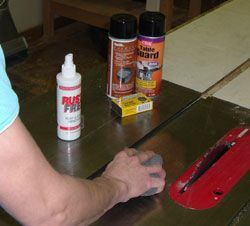 Of course, the absolute best way to eliminate rust from the surfaces of machines and other tools in your shop is to stop it from ever really getting started in the first place. And in an ideal world, that’s how it would work! But just in case you are already noticing rust developing on some of your tools, we’ve got some solutions to help you remove it. Check out this great article on preventing rust before it starts and getting rid of it once it latches on, and good luck! My Chicago area shop is in the garage and subject to much condensation in spring and fall. I try not to open the garage doors when it’s warmer outside than inside. I wax all my iron tools (and most wood too) with Butchers Bowling Alley wax and have had very little rust. I love that stuff and it’s cheap. I do rust removal electrolytically on small items. On larger items wet/dry sandpaper lubed with WD40. The majority of my tools came from yard sales so I’ve had a lot of practice. Where can I buy the bowling alley wax you use. @Troy – it looks like bowling alley wax is available online at http://www.bwccompany.com/bowlingalley.html, but we would recommend trying our Renaissance wax. It is a little more expensive, but really effective at preventing rust. It not only helps to prevent rust, but it will make all of your machines run more smoothly as it is an excellent friction reducer. @Jim – thanks so much for the suggestions! We love getting tips and different ideas from all of our readers.